looking for a quick quilt project for the summer? 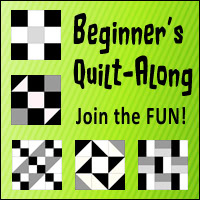 pat sloan and the quilting gallery are hosting the beginner's quilt-along! i am thinking about joining in this one! it looks fun, easy, and FAST. wanna do it with me? we could motivate one another to the finish line! even if you don't do it, you should head over, they are having a reliable iron giveaway! speaking of finish lines, the color run is coming up! i have been walking/jogging to try to "train" for it, but i am still so not in shape. i hope i don't pass out or fall down or something! got new kicks yesterday too - nike pegasus, shiny and new. so now the guilt over buying them is another motivator. heehee.